George Graham Reviews Emmit-Nershi Band's "New Country Blue"
Bluegrass and jam band music seem to have a natural affinity for each other. Both are improvisational, and depend on a degree of instrumental skill. In fact, going back to the Grateful Dead, Jerry Garcia was involved with a couple of spin-offs that got into bluegrass, including Old and in the Way. Some contemporary jam bands show their bluegrass influence rather strongly, including The String Cheese Incident. While that band is on hiatus, the individual members are issuing CDs, including keyboard man Kyle Hollingsworth whose release we recently featured on this album review series. This week, we have another String Cheese member with an outside project. While Hollingsworth showed a kind of funk influence on his CD, this one takes a decidedly bluegrass direction. 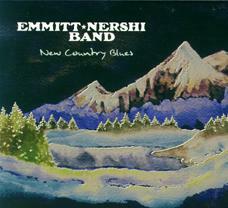 The group is called the Emmitt-Nershi Band, and their recording is called New Country Blues. The String Cheese member is Bill Nershi, who plays guitar on the CD. Mandolinist Drew Emmitt is a founding member of another Colorado band, Leftover Salmon, who had a reputation for combining bluegrass instrumentation with a jam band sensibility. Apparently, this group, headed by the Emmitt and Nershi is meant as a regular performing and touring band, rather than just a one-off project. The other regular members are bassist and guitarist Tyler Grant, and banjo player Andy Thorn. They are supplemented on the CD by fiddle player Jason Carter, known for his work with Del McCoury's band. And another String Cheese member, Keith Mosley puts in a couple of cameo appearances on bass as Grant plays guitar. Also appearing is Steven Sandifer on percussion, mainly a little light snare drum on most of the tracks. The CD turns out to be fairly well-named. There is a little country and some of the tracks tend toward the bluesy. It's all original, rather than including any traditional music, and a lot of the tunes sound as if they were written for a rock band and then translated for bluegrass instrumentation, reminiscent of the Old and in the Way album with Jerry Garcia, Peter Rowan and David Grisman some 35 years ago. There is a mix of instrumental and vocal material, and Emmitt and Nershi alternate on the vocals, singing their respective compositions. The musicianship is tasteful, and when they jam out, they don't get bogged down in mindless noodling. On the other hand the country side alluded to in the CD title comes on the song I Come from the Country, which was written and sung by Tyler Grant. <<>> It also provides a bit of a jam as well. New Country Blues the new CD by the Emmitt-Nershi Band is a worthwhile mostly bluegrass album that brings together a couple of Colorado jam band guys who are fond of bluegrass. It's a very compatible combination and the musicianship and the compositions are first-class. There's enough room for instrumental jams to keep their respective fans happy, but without turning it into a test of patience. The music ranges from rather traditional in sound to more eclectic, with the borrowed influences coming as much from rock as anywhere else. Our sound quality grade is close to an A. The acoustic instruments are well-recorded, and there are no unnecessary sonic gimmicks. The dynamic range, while not an audiophile level, does allow some difference between loud and soft. Bluegrass and jam bands can make a nice combination, and the Emmitt-Nershi Band's new CD neatly illustrates that.